Mountain View, CA. – August 31, 2013 – The “Happiest 5K on the planet” just got happier! Speck will be sponsoring seven Color Run events across the country this year with an exciting, vibrantly colored, and awesomely messy activity. The Color Run is a 5k run/walk for people of all ages. By the end of the course, you will be covered in color after making your way through several color zones – pink, yellow, blue, green and more! After finishing the run and being effectively turned into a walking rainbow, come by and see us at our tent for an extra splash of color. 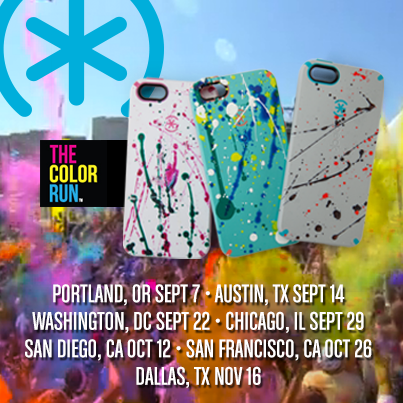 All our fans will have the chance to come into our “Color Zone” and splatter-paint some of our most popular cases – after you’re done throwing paint you can even take your creation home with you! We will have tons of cases covering the walls and buckets of bright paint with paintbrushes at the ready…we wanna see just how colorful it can get inside! There’s only a limited number of cases to be splattered, so make sure to stop by as soon as you finish the run! First stop is Portland, OR next weekend! We’ll be there with our CandyShell cases and buckets of paint, rain or shine! Will we see you in any of these cities?